To make our office-sharing-situation good from the start, I asked my soon-to-be roomie, Lauren, if she’d like a hand knit hat. She was happier about it than I expected and asked if it could be green. Luck would have it, I had a nice little stash of green comfy cotton at home. She had no other preference than to be “a little slouchy in the back.” So I dug through my queue on Ravelry and decided on a pattern I thought would work great with the yarn and her request for slouchy. 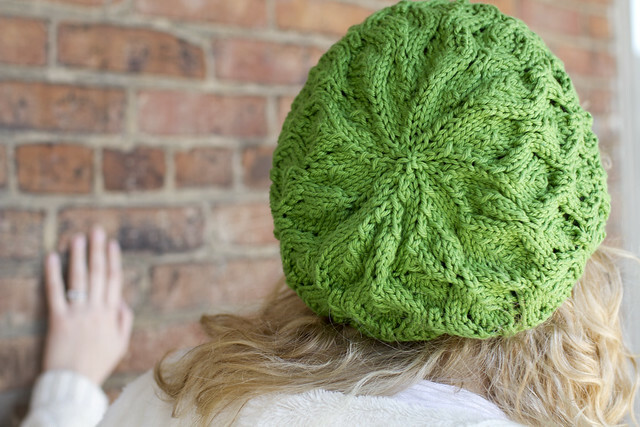 The working of K2togs and PSSOs give the hat a fun, swirly texture. Of course, those same K2togs and PSSOs gave me a headache because I started this hat three times. The first two times I successfully ribbed the start of the hat but then it went down hill in a hurry. I couldn’t figure out how so many people on Ravelry “love this pattern” and had “knitted this eight times now.” The problem wasn’t the pattern but rather the knitter. (Not a shocker, folks.) Something about not having the right number of stitches to repeat in the pattern. But I’m a smart cookie. And third time’s a charm. And the finished piece was perfect. And of course, I made Lauren model it for me. It looks really good on – and with Lauren’s blonde curls sneaking out the sides, it works for her style. It was made for her. Literally. Because I made it. Whatever, it just works. Now that I know the pattern, I want to call a rematch and cast on a second one because I know there would be no hiccups. But now the problem is finding time to knit. 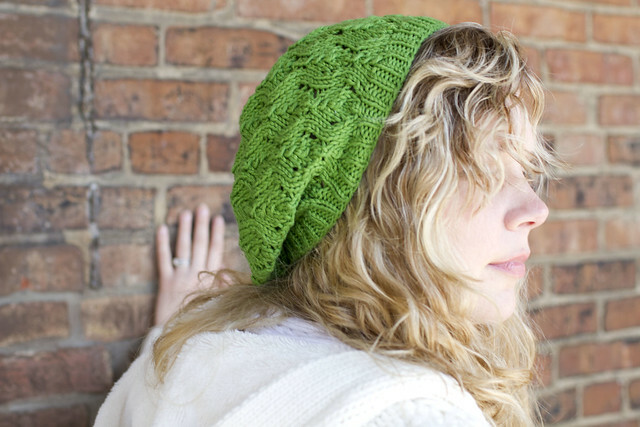 *Pattern: Ballard Slouch Hat by Felicia Lo, free download on Ravelry.com. Susan - That is gorgeous! It looks great on Lauren. Love it! Rachel - Looks great! I have tried two different hats now. One I started on several times and even tried smaller hooks. Still ended up being way too big! I then made another hat – more similar to the style of this one you did – and I almost made it too small! But luckily my sisters head is smaller than most! I think I will stick to purses and stuffed things – much better at that! Christy - Oh my gosh! I love it! I need to learn to knit – it’s so useful & beautiful! Wendi @ Bon Appetit Hon - There’s magic in your knitting needles! katie o. - I have one that looks just like that! And it’s green too. Totally can’t go wrong with green. You did a great job. I’m so totally impressed by your knitting skills.